All types of dishes of paneer, most people like but Shahi Paneer is very tasty curry made with paneer (cottage cheese), the glory of every party, make Shahi Paneer curry for your guests or on your special day.This is tradational recipe that has been followed generations and has been mainstay in Indian cuisine since the time of Mougles. This recipe uses cashews and nuts for bring in the rich texture and flavor. 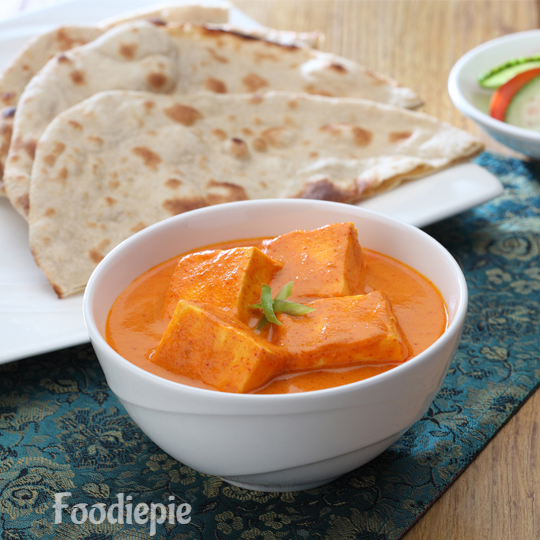 This Shahi paneer recipe is also kids friendly.Let's checkout recipe. Step 1 : Crush the blanched onion to medium coarse paste in a grinder.Heat the oil in heavy bottomed pan over medium flame.Add cinnamon,green cardamom and cloves.Allow them to crackles. when it begins add crushed onion. Step 2 : Stir fry for 3-4 minutes or until it turns into light brown. Step 3 : Grind cashews nuts and coriander nuts in grinder and make smooth paste. Step 4 : After that,add ginger garlic paste,turmeric powder,red chilli powder,coriander powder, cashew paste and stir fry for minutes. Step 5 : Add crushed tomato puree and salt.Stir frying for 2-3 minutes. Step 6 : Add curd and 1/3 cup warm water not hot.mix well and wait until oil starts seprate. Step 7 : Take away pan from flame and let the mixture cool down for five minutes.Discard whole spices which is add in first step cinnamon and cloves. Step 8 : Transfer the mixture to blender jar blend it to smooth puree in blender. Step 9 : After that,again transfer it to same pan and place on flame. Step 10 : Add fresh cream and garam masala powder.Mix well and cook for a minutes.